... in which there was one single seemingly magical, omni-beneficial, deeply healing, spirit-lifting organic skincare line that practically took care of all of your needs—no matter your age, gender or specific areas of concern? Well have we got a product line for you!! All Active Botanicals, Essential Oils and other nut-free components are sourced from the most conscious growers-employing methods that produce the highest quality natural, wildcrafted and organic ingredients across the globe. All of my products are made in the US from domestic and imported components never containing parabens, phthalates, synthetic fragrances, PEGs, or SLSs. 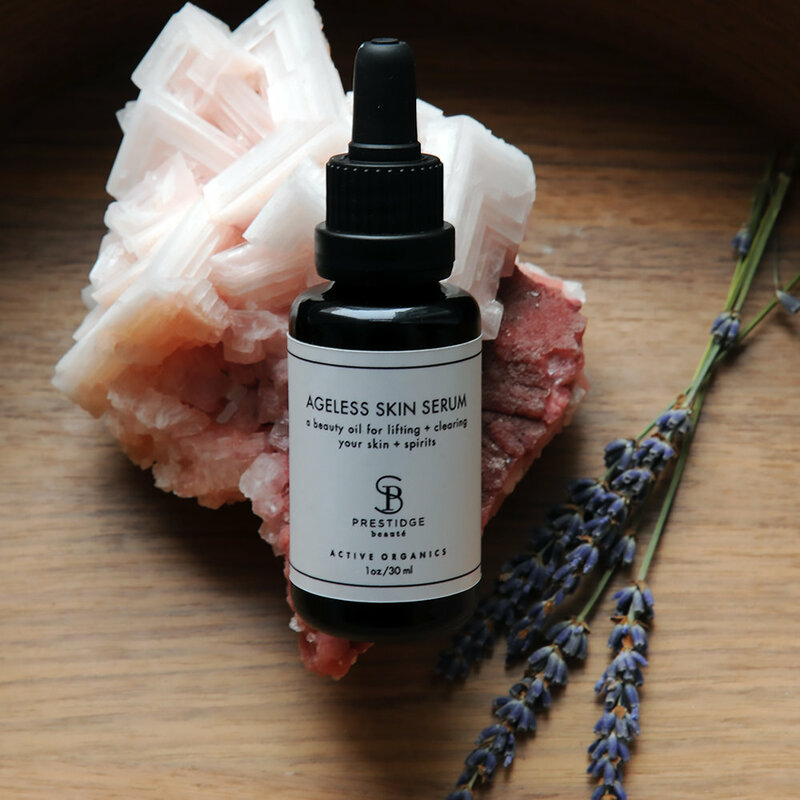 PRESTIDGE beaute’ Active Organics are lovingly made in my serene Brooklyn lab employing Reiki techniques. They are carefully crafted by hand with the finest organic ingredients, guided by my years as an esthetician, decades as a makeup artist working with celebrities, global brands & beauty giants, and inspired by my desire to create a line of clean skincare products that yield stunning multi-beneficial results that I have yet to encounter in all my years as a beauty expert. PRESTIDGE beauté Active Organics' potent and purifying properties encourage cellular regeneration for improved elasticity and healing, soothe and calm-reducing inflammation, combat impurities and vastly improve skins overall appearance and texture. I bought some of Shawnelle’s product (Ageless Skin Serum) at Andrea Linett's Brooklyn shopping day (BKLYN SHOPS) and am completely obsessed with it. IT WORKS. It smells amazing, feels so good, and it really does take down puffiness and somehow smooth the skin so well that it reduce the appearance of some of my lines. I can’t actually believe how great it is – usually skin stuff just feels nice, but this one is next level.